Don and I were living in Norwalk, Connecticut back in 2001. We both had jobs that required lots of travel and nights away from home. We were a married couple without kids with busy careers. This was our life. In 2001 I was the Director of Field Marketing for Einstein Bros Bagels based in Golden, Colorado and Don was a Creative Director working on AT&T Wireless with Ogilvy & Mather in New York City. He took the Metro North train to NYC every day. I was often on a plane traveling to our corporate headquarters or other regions for meetings. Elli wasn't part of our family yet. What we didn't know at the time was that she would be born in China just 8 weeks later on November 5th, 2001. 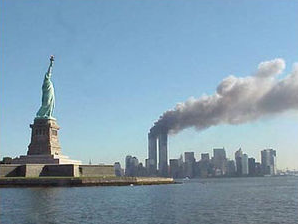 On the morning of September 11th I was on my usual United flight from LaGuardia to Denver. I took this flight so often I could drive to Laguardia with my eyes closed. I often saw the same people on the flight. There were other commuters just like me going to Denver every week. My flight to Denver left at 8:15am. We were on a very large plane, and it was less than half full. Our take-off was normal. Nothing out of the ordinary. I took this flight almost every week. It was my commuter flight to Denver. Flying on a plane back in 2001 was different than today. Security was a breeze. There were no electronics to occupy your time. You brought a newspaper (I was a fan of USA Today) or a paperback book. Or you chatted with your seat mates. Seriously, people actually talked to each other on flights. Don had pulled another crazy all-nighter finalizing another AT&T campaign. He and his team stayed at the office all night to finish their project. This was such a common occurrence Ogilvy had an arrangement with the hotel next door where employees could go to grab a few hours sleep and a quick shower. As far as I knew he was either at the hotel, or back at the office. Everything seemed fine on our flight until a few guys noticed our plane was not on its regular flight path. The flight attendants told us we were being re-routed to O'Hare and they wouldn't say why. This was really strange. There was nothing wrong with the plane or any of the passengers, and the weather was fine. We all started using our cell phones even though you weren't supposed to. We had to let people know we would be late. My schedule was tight. If I had to make a connection I was definitely going to miss my meeting. I couldn't get my phone to work and I was getting really frustrated. I was cursing my cell phone carrier. My seat was in row 12 on the right side of the plane. I vividly remember how empty the plane felt. There were very few passengers for such a large plane. I also remember two guys to my left, a few rows behind me, who had on red turbins. I thought it was odd. Who wears a red turbin? They never left their seat or reacted when some of us were huddled trying to figure out what was going on. They just sat there staring straight ahead. I only mention this because it was out of the ordinary. There was a guy sitting a few rows in front of me who finally got through to someone on his phone. He stood up and quietly told all of us that a plane hit the world trade center. We were in shock. What was he talking about? We thought it must have been an accident. An act of terror NEVER occurred to any of us. It was unthinkable. We all gathered around him so he could update us on what was happening. My phone finally started to work but the only person I got through to was Nicole Sakansky, a girl I worked with at Einstein's, and her jaw was wired shut so she could barely talk! So crazy. My parents, who lived in Sun City Grand, were watching the news and were worried sick about me. I had spoken to my dad the night before and he knew I was on a flight to Denver. They didn't usually know my schedule. In fact it was a little random that I had spoken to my dad and told him my travel plans. The pilots had lost all communication with air traffic control because the FAA was fearful the terrorists were listening, so we (the passengers) were telling the flight attendants what was going on and they passed the information on to the pilots. We knew it was bad when we looked out the window and saw we were being escorted to the airport by air force jets. This made us really nervous. Now we were scared. I wasn't able to reach Don until the afternoon. To say I was freaking out is an understatement. I didn't know where he was. His office was on the west side at 8th and 49th. But I didn't know exactly what was happening since we were just getting bits and pieces from friends and family on our phones. What if he had a client meeting or an edit somewhere I didn't know about? My stomach was in knots. When we finally got to O'Hare it was a ghost town. Everyone in the airport had been evacuated. All the vendors were gone and their businesses closed. No TVs were on. There were no people anywhere. It was totally quiet and deserted. Our voices echo'd in the halls. It was really creepy. 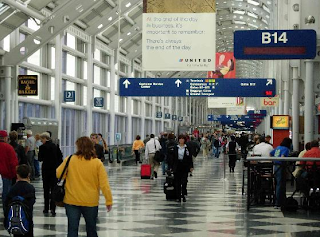 This is what O'Hare usually looks like. Imagine it totally empty. It's a very large space. It was very, very quiet. I was luckier than most on our plane. My brother and his family lived in Barrington, a suburb of Chicago. So he came and got me. All the other passengers were calling hotel after hotel. They were all full because a lot of the people who were supposed to fly out that day and couldn't re-booked their room. I was never so happy to see my brother. Poor Don was stuck in NYC for a while until they got the trains to Connecticut working again. We finally connected on the phone that afternoon. It was such a relief to both of us to know we were both ok and that most of the people we knew were ok. It was very weird not to be together. I just wanted a hug. He sat next to someone on the train who had made the long walk from Battery Park to Grand Central. He was covered in soot. I got a phone call from one of my tennis buddies late in the afternoon telling me one of our friends' husband worked in the WTC and he was missing. We knew what this meant. Just one day earlier, on Monday afternoon, we had played tennis together. Meredith was telling us how she and her husband Peter just bought a beautiful farm house (their dream house) in Wilton and were going to have everyone over. We kept waiting for a phone call with good news. It never happened. Her name is Meredith Fry. Her husband was Peter Fry. They had two little girls (teenagers now.) I will never forget her name or her face. My meeting in Denver was obviously cancelled. After three days of trying to figure out how to get home by air, I finally rented a car and drove from Chicago to Connecticut. It took me 13 hours. I stopped once. You could still see the smoke from the buildings when I crossed the George Washington Bridge. When I got to LaGuardia to get my car it was eerie. The airport was still closed. The only cars in the parking garage were from passengers that had flown on 9-11. I feel incredibly lucky that the plane I was on made it safely to Chicago. I will be forever grateful to my brother Dave and his wife Deb for housing me for nearly a week. I don't know what I would have done if they didn't live there. This weekend, on the ten year anniversary of 9-11, I'll be thinking of my friend Meredith and her kids, and all the other families affected by this tragedy. So interesting, Kris. I knew you were on a flight that landed on Chicago but did't know the whole story. On our end, we were desperately trying to get word to Danny in Pakistan. Such an awful day! We need to remember every day to hug the ones we love and let them know how much we love them. I can appreciate everything you are saying. My daughter is 8 years old and was exactly 6 months old when 9/11 happened. I don't feel like we do enough to remember how we felt that day. As a country, we need to do a better job of educating our children and remembering that day. I know I will never forget it. I can remember the panic of what was happening and not knowing what else would happen. It was very scary. I lived in Cleveland, Ohio at the time and there was reported to be a bomb on a plane landing at the Cleveland Airport. Everyone at work was allowed to go home. I remember driving to get my sweet little 6 month old and knowing right then that everything was going to be different from here on out. I remember looking at her and thinking what kind of world was she born into? I know I'll never forget it. Thanks for sharing your story. I'm glad to hear that there are people out there who care enough to write about it. I just posted my blog on 9/11 and saw you had one too. Your writing and experience brought it to life again. I can't imagine being on a plane that day in the middle of it all. Thanks for sharing your story. I remember well too. We were all frantic because Don didn't know if you were safe and had no contact with you. We were devasted watching all the people frantically running from the buildings covered in soot. Then to see the second building go up in smoke...We were glued to the TV's......it was horrible. I was at work and people were praying like crazy for all that were trapped and for all the others that were trying to save the people they could....When the airplane crashed we prayed you hadn't been on a different flight for some reason. We have a lot to be thankful for and I made sure our flag was out at home and had flags in the fitness center at work.........and yes I wore red to work in honor of those that didn't made it. I hope we never see a day like that again. This gave me chills. I cannot imagine finding out while in the air. How horrifying for you. Oh Kris, if we could only tell you how scared we were for so many hours that day, until we finally knew your flight wasn't part of the plot. We were so grateful that Don was still uptown and not part of the WTC collapse - we knew then how blessed our family was - truly blessed! Thank you for writing about it. We love you guys a whole lot! Amazing story. I'm so glad you shared it. My family is very thankful, too because my husband and I were living in NYC at the time of 9-11, both at work in midtown Manhattan the morning it happened. I will never forget seeing the streams of people walking up from Battery Park or crowds of confused people we walked with as we made our way through Manhattan or my fellow subway passengers covered in soot as we rode uptown home. Never. We were two of the lucky ones and we're grateful. This day was a horrible day for everyone. I can't imagine what it was like in your case, on an airplane. You must have been terrified. I was in a room full of 5th graders and not allowed to tell them, therefore, not able to show any kind of emotion. It was difficult. Thanks for sharing your account of a horrific day. 10 years later and 911 stories still give me chills. Thank you for sharing your story. I was teaching school that day and couldn't watch anything until I rushed home. I remember being 2 months pregnant thinking what is happening to the world and being so frightened.